It’s no secret how Tech N9ne got to be the top indepedent MC in the game. His loyal fans have pushed his music for over a decade, and with the recent success of All 6’s And 7’s, the industry has finally taken notice. 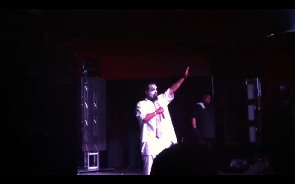 During the Sacramento, CA stop of his All 6’s And 7’s Tour, Tech addressed the crowd and thanked his fans for pushing All 6’s And 7’s to #4 on Billboard’s Top 200. Sincere and humble as always, Tech expressed his gratitude to the packed crowd, and explained how it is that he has reached the top without a major label.